We've all done it. While sipping on a fine cherry wheat or a blueberry stout, admiring the perfect balance of beer and fruit, the thought occurs: "Hey, I could brew this!" 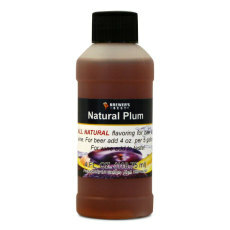 With our flavoring extracts and fruit purees, turn these thoughts into reality! Easy to use and delicious, these can make a stellar end product with just the right flavor profile. 4 fl. oz. container is enough flavoring for a 5 gallon batch of beer, wine, cider, or mead. We suggest add less at first, taste, and add more if desired. Works well in a number of fermented beverages, such as beer, wine, cider and mead. Simple to use, just add to taste to the fermenter or at bottling/kegging time! 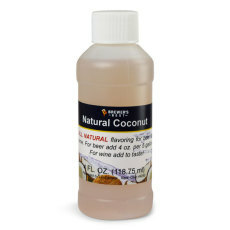 Coconut Natural Flavoring, 4 fl oz. A coconut flavoring used in the beer or winemaking process. 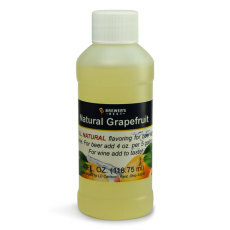 Grapefruit Natural Flavoring, 4 fl oz. A grapefruit flavoring used in the beer or winemaking process. Raspberry Natural Flavoring, 4 fl oz. 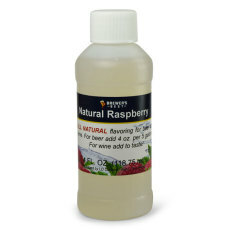 A raspberry flavoring used in the beer or wine making process. 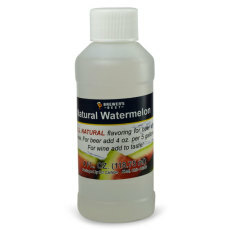 Watermelon Natural Flavoring, 4 fl oz. A watermelon flavoring used in the beer or wine making process.